"Music is a place to go to take refuge," says Lisa Gerrard. How true... Anyone should be able to find solace in Gerrard's music as amongst its elegant arrangements is the world's most basic sound source, the human voice. Immortal Memory (57'04") is Gerrard's third studio album since leaving Dead Can Dance, and a well deserved break from soundtrack work as well. Here, Gerrard sings in Gaelic, Aramaic and in her well known vocalise style of wordless emotionally charged tones. 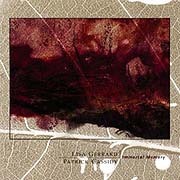 Ranging from compassionate elegies and idyllic nocturnes to dramatic evocations and woeful laments, Gerrard's voice soars gracefully above composer Patrick Cassidy's hauntingly beautiful sampled string arrangements. This is quite a serious album yet still retains a fairy tale quality - one of purity - where songs are found within the language of poetry. The extraordinary reach of Gerrard's voice is legendary. Moving effortlessly through different registers, she slides from full-throated exaltation to soft benediction and on to that which is seemingly beyond human range - be it supernatural or otherwise. Immortal Memory is cinematic in scope, and without the boundaries of a framed screen drama, goes beyond the limits of a conventional moving picture soundtrack... cohabiting a more cerebral venue - the theater of the mind. If you're haunted by sadness, loss or regret, the music on this album has the uncanny ability to call forth these experiences, somehow relived but under the additional weight of a grieving score - alternately, Immortal Memory is also healing, easily returning us to life's singular and most cherished moments. Is this music the next step for New Age music? Is it Goth-Opera? Cyber-Folk? The Spiritual side of the Avant-Garde? Or the future of Classical music? The best insight comes from Gerrard herself, "I don't analyse music. I respond to it on an emotional level and I hope that's what people will hear."